Microsoft is giving Milo and Kate credit for things it might not have actually done. Microsoft's Alex Kipman reiterated that Milo was never meant to be a commercial product. Instead, he said, it was a sandbox where developers learned how to use all the tools that Kinect brought to the table in a single experience. 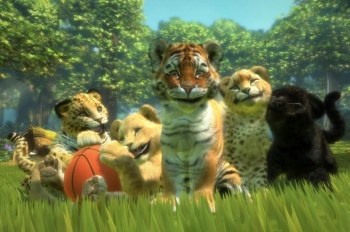 The knowledge gleaned from working on Milo, about how you could make strong emotional experiences using Kinect, not to mention the Kinect technology itself, had "migrated" over to Kinectimals, which Kipman said had many of the same virtues, only with a cute tiger cub in place of a young boy. "This is one of what I would say was one of the key innovations," Kipman said. "That captured people's minds with Milo - this idea that we could create an emotion engine, an engine that would fuse these human input behaviors and create a relationship with this imaginary character. What I think you see in Kinectimals is precisely that." This all sounds fine, but when Microsoft Game Studios' Phil Spencer suggested the same thing back in July, Frontier Developments' chairman David Braben was very quick to deny it, saying that Kinectimals had been in development before the studio had even become aware of Milo's existence. Assuming that this isn't some attempt by Microsoft to save face after showing off a game that was too ambitious to ever be released; either Braben or Kipman is mistaken. Considering that for a while Microsoft couldn't seem to make up its mind whether Milo was just a tech demo or not, it seems reasonable to assume that it's Kipman that has the faulty information.